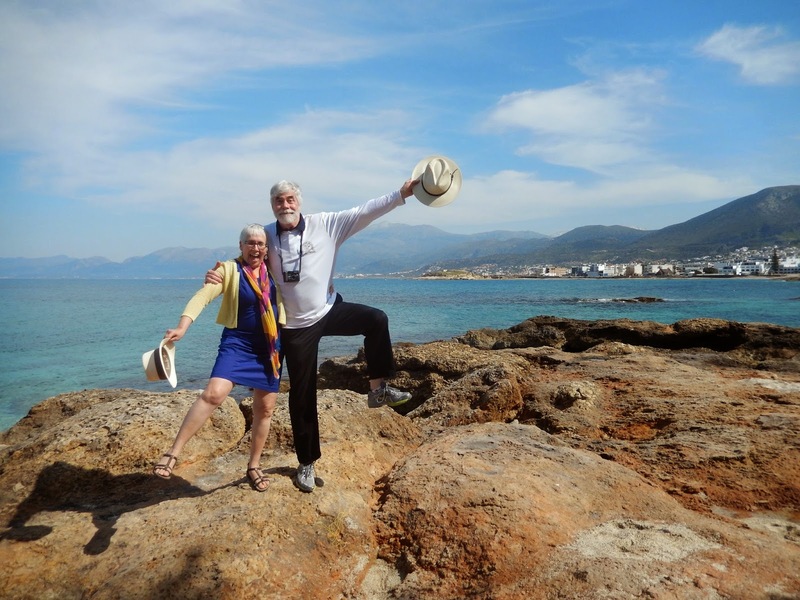 Who wouldn't be happy on Crete? The majority of our time in Greece was spent on its largest island, Crete. We had such a variety of experiences there, that I can see why it is a popular travel destination. 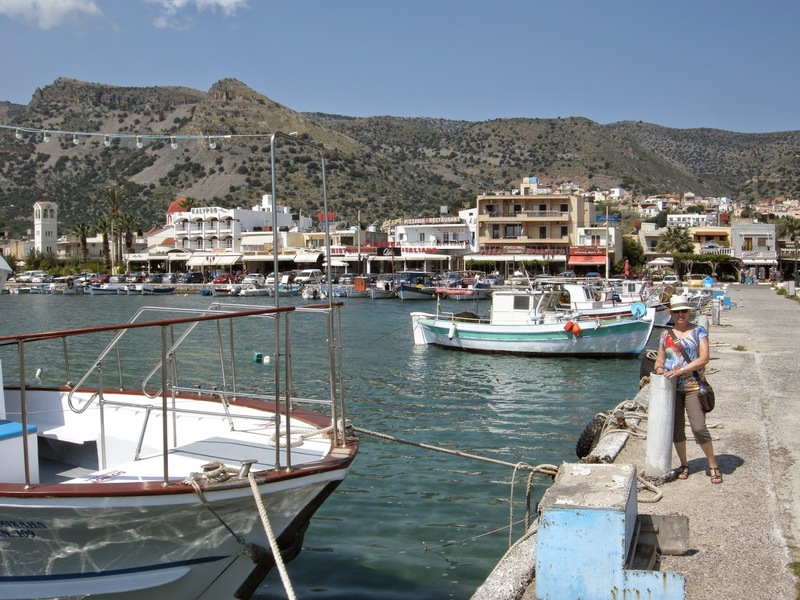 With ideal weather conditions and clear Mediterranean waters, Crete was just about perfect. 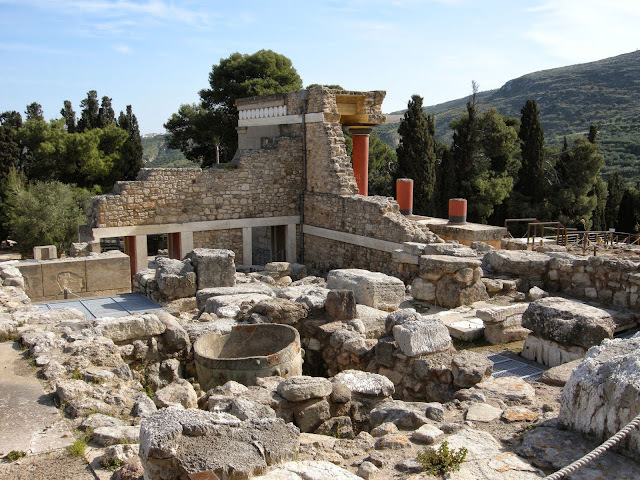 Postcard worthy picture of the Palace of Knossos. When we debarked from the ferry from Athens that first morning, we were immediately whisked off to the Palace of Knossos, a very impressive reminder of the Minoan civilization that thrived on the island thousands of years ago. Our guide enthusiastically pointed out the highlights of this archaeological site. Much of it has been lovingly preserved while other parts of it have been recreated in durable cement - not authentic but long-lasting. 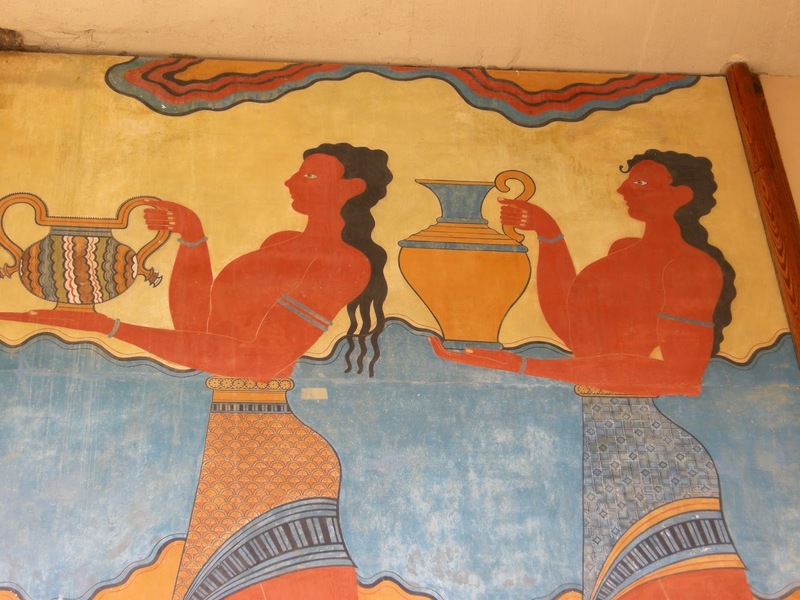 I was impressed by the quality of the frescoes that I saw, even though they were recreations. I was also intrigued and puzzled by the colour of the people depicted: consistently, the men were painted in reds, while the women were white. Later in the day, at the Archaeological Museum in Heraklion, we saw many other examples of this practice. These are men since they are painted red. 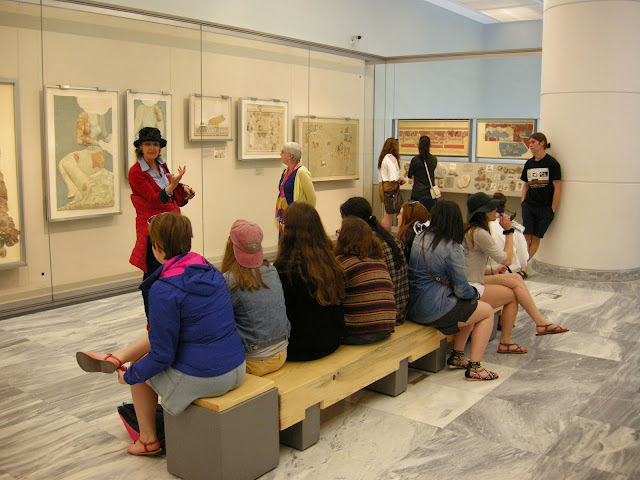 This museum was very impressive, as it housed fine artifacts from other cultures as well. 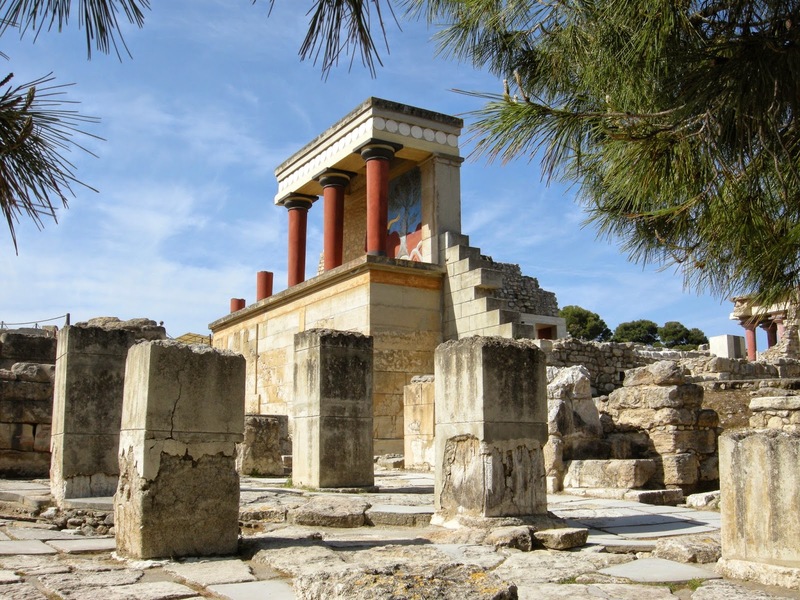 Even though some of the other groups lived after the Minoans, the latter appeared more advanced. It is a shame they died out. 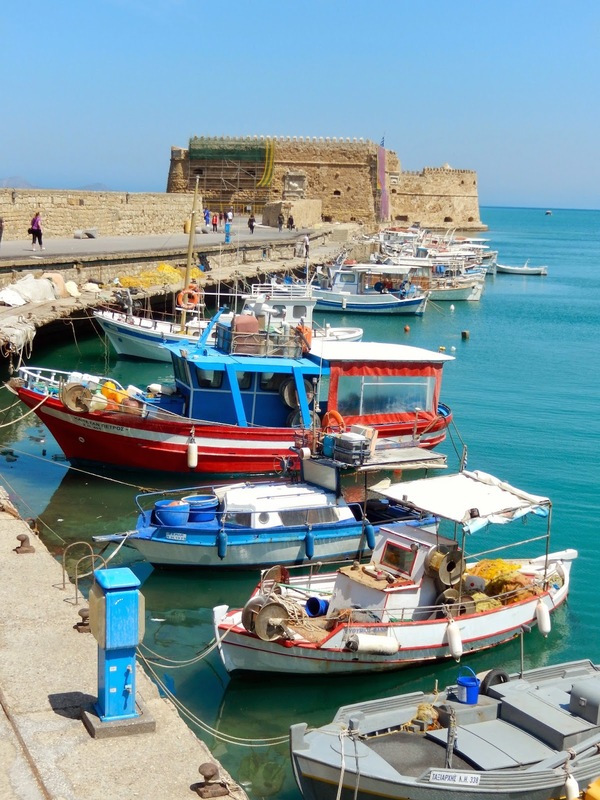 Over lunch, we were given free rein to explore Heraklion, the Cretan capital. A walk toward the harbour revealed the beautiful Mediterranean waters and the walls of a former fortress, next to colourful fishing boats. In the distance were snow covered mountains. What a lovely place! 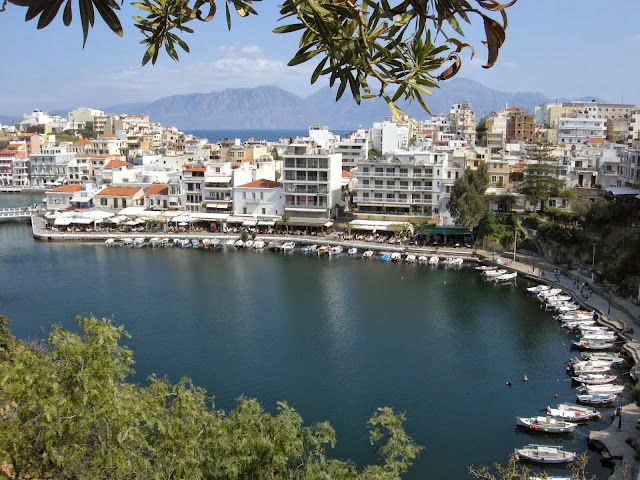 Unfortunately, the students did not get as much out of their morning excursion as they might have since many of them complained of having slept poorly on the ferry, so they were thrilled to be taken to the resort where we would spend the next three nights. As soon as they saw the beach nearby, they were re-energized. From the moment we arrived, most of them spent their time in or by the water. Oh to be 18 again - time to hit the water. We slowed down over our three days at the resort. 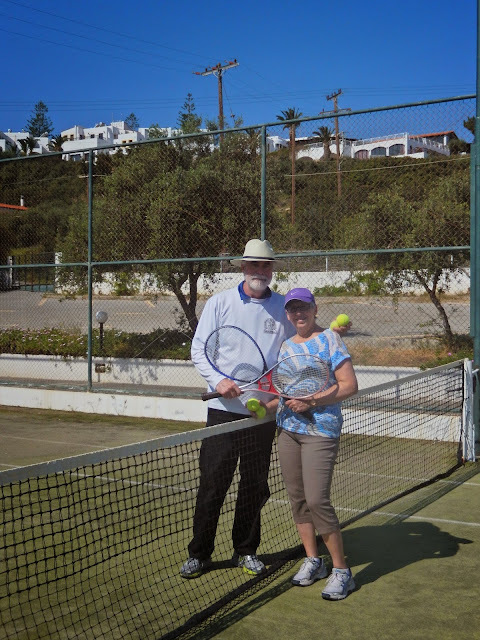 One day we had no scheduled activities, so, after an hour of tennis, Bob and I walked twenty minutes to the closest town, Hersonissos, for lunch and some shopping. Spring fever must have been in the air in Crete. 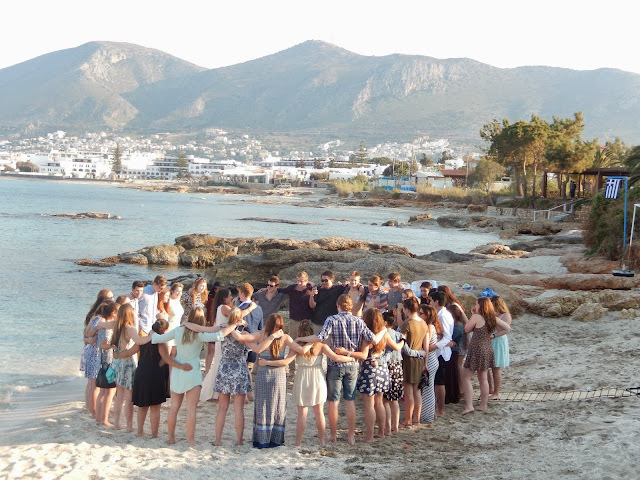 On our final evening there, the students staged a mock wedding on the beach to which we were all invited. Most of the guests dressed up for the event – bystanders likely thought that the ceremony and the speeches were real, but it was all just harmless nonsense. The group encircles the "bride and groom" as they dance at their wedding. On the morning of our departure, we headed to destinations on the eastern part of the island. Our first stop, Elounda, is a small resort town with a picturesque harbour - in fact, picturesque harbours are everywhere on Crete. We spent about a half hour there, just enough time to stroll around. 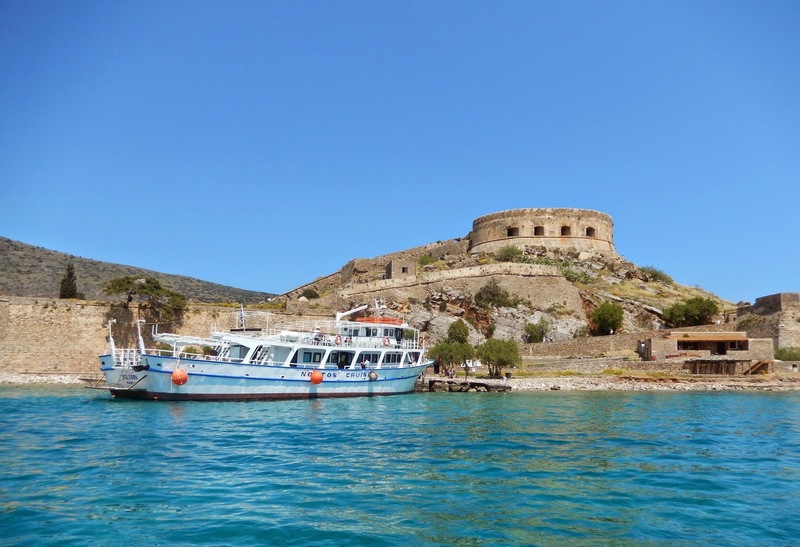 Nearby, we boarded a small boat which took us to Spinalonga, an abandoned island with a very interesting history. Arabs invaded it in the 8th Century, and much later, it was owned by the Venetians, who carved it out of the island of Crete and built a fort there. In the 18th century, it was part of the Ottoman Empire. 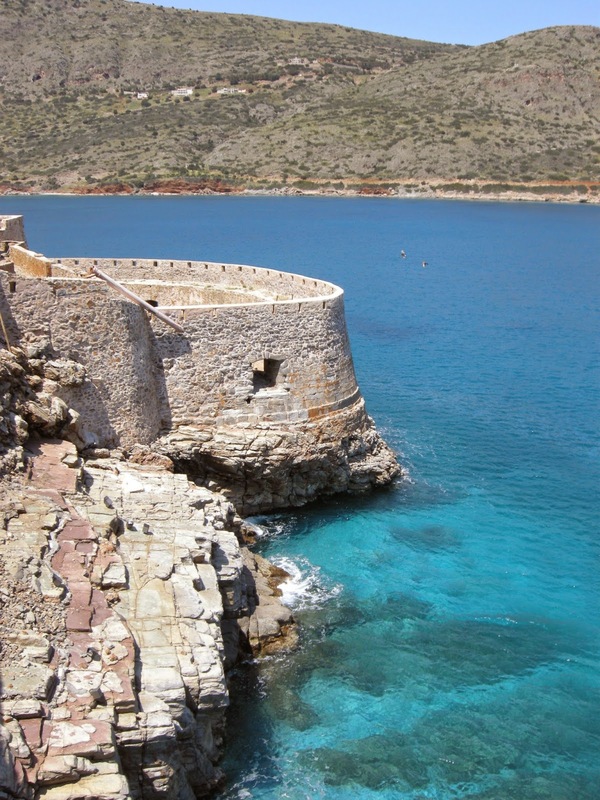 Finally, most recently, it was used as as a leper colony from 1906 to 1956. There was a haunting quality to this place. After all, the lepers have not been gone very long. We walked the entire circumference of the island, and as we did so, we imagined the loneliness of those who were banished there. Our guide pointed out that we were on the island at the best time of year, since the flowers were in bloom. In all the other seasons, it is barren and very hot. 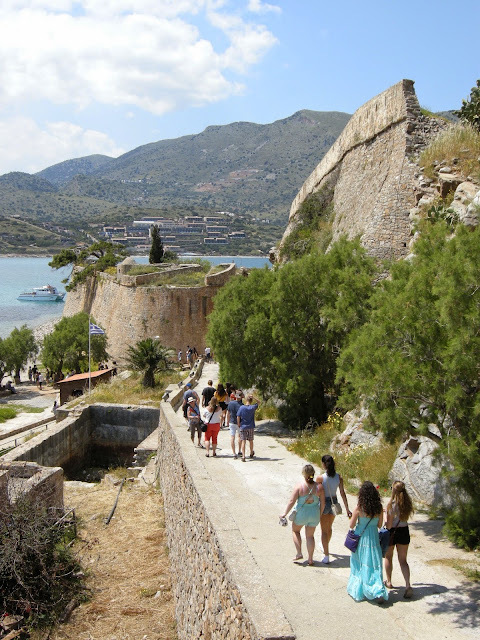 The stark beauty of Spinalonga. 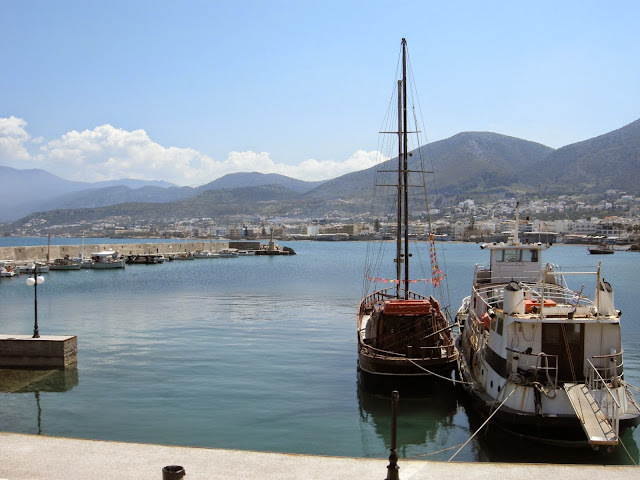 Eventually, we returned to the bus and were driven west to Agios Nikolaos, the former capital of Crete. There we had lunch beside the harbour - of course. 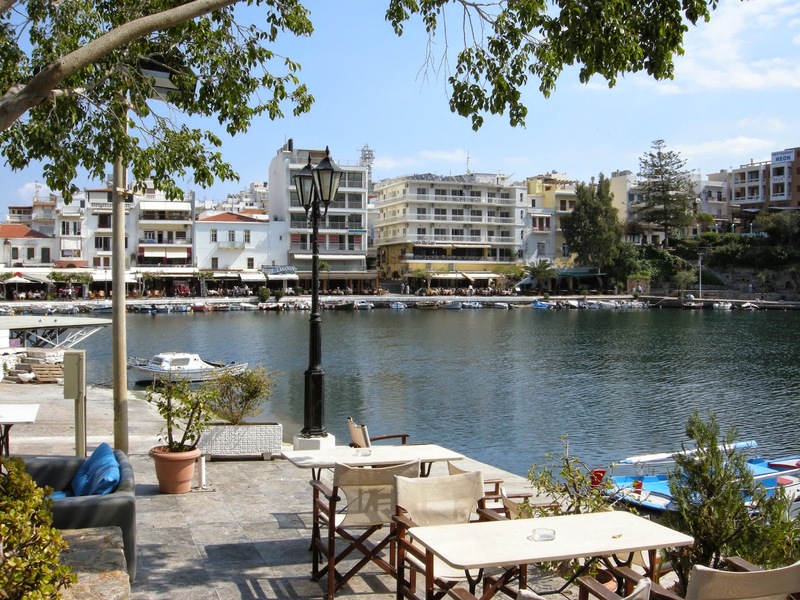 This lovely city is notable for its manmade lake right beside the sea. I enjoyed the shops there too. 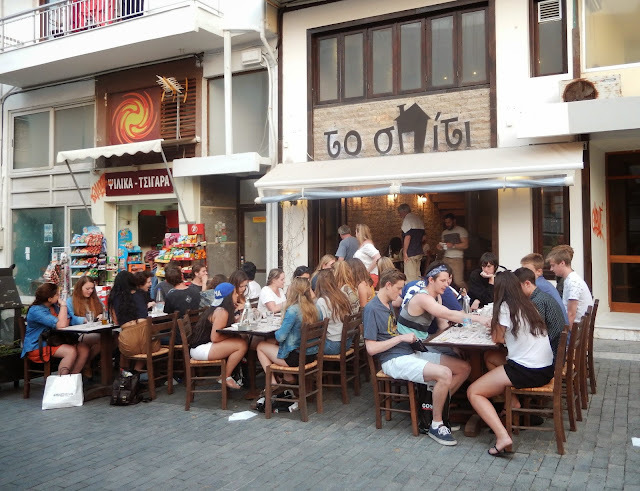 Finally, we returned to Heraklion for a Cretan dinner at an outdoor taverna. It was - in short - absolutely delicious, a fitting farewell to the island. By 20:00, we had returned to the Minoan Ferry line for our overnight passage to the mainland. 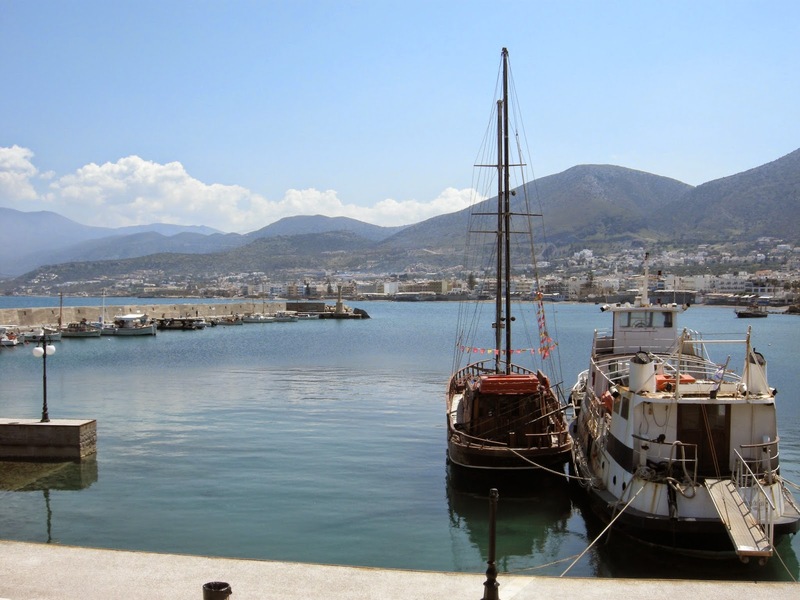 In my opinion, the journey was uneventful, although we heard the next day that there had been a 6.1 earthquake off the coast of Crete.